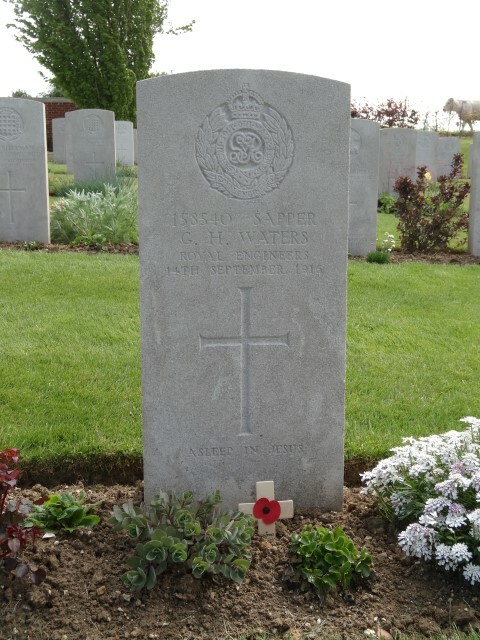 158540 Sapper George Henry Waters, 256th Tunnelling Company, Royal Engineers was killed in action 14 September 1916 and is buried in Maroeuil British Cemetery, France. He was 26 years old and is commemorated on the Copley War Memorial and the memorial plaque in St. John the Evangelist Church, Lynesack. In 1891, the family lived at Copley where William was a self- employed shoemaker. By 1901, William was described as a “bootmaker.” 17 year old Luke and 14 year old John were employed as stone masons. By 1911, the family lived at the Post Office, Copley and William was recorded as a “Bootmaker Dealer.” George Henry, now 21 years old was employed as a coal miner, putter and hewer. In 1913, George married Mary E. Fletcher. George Henry Waters enlisted at Bishop Auckland into the Corps of Royal Engineers being allocated the regimental number 158540. He served with the 256th Tunnelling Company. 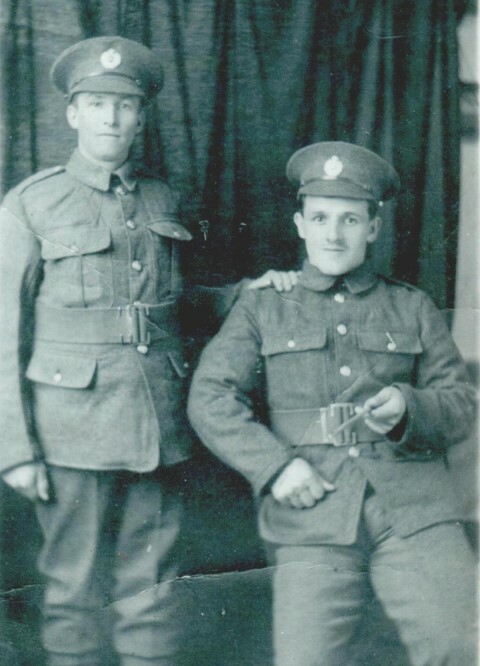 Details of his service record and the war diary of the 256th Tunnelling Company RE (256 TC RE) have not been researched. The date when Sapper G.H. Waters enlisted and entered France is unknown but he did not enter France until after 31 December 1915 since he was not awarded the 1914-1915 Star. In July 1916, the 256 TC RE was the last tunnelling company to be formed with Capt. W.T. Wilson in command. It was placed on the Vimy Front, No.3 Section and took over from the 184th Tunnelling Company. The 256 TC RE moved to Nieuport, Belgium in June 1917. It seems reasonable to assume that Sapper G.H. Waters served in the Vimy area, between July 1916 and his death, 14 September 1916. The formation of the new RE tunnelling companies began during the winter of 1914-1915 and was treated as an urgent priority by the War Office. Miners declared surplus to the war effort at home were encouraged to join up. Once at the front, after a very short period of military training the new companies were rushed to the areas where their expertise was most needed. The distinction of the first company to blow a mine under the enemy trenches belongs to the 171 TC RE – 4 March 1915 at 7.40pm near Ypres. By July 1916, there were now a total of 32 tunnelling companies – 25 British, 3 Australian, 3 Canadian and 1 New Zealand operating along the British Front. A census taken in June 1916 recorded that there were between 18,000 and 24,000 men continuously employed underground. When at full strength, a company could field 500-600 miners and was often reinforced by fatigue parties drawn from infantry battalions in reserve. Company numbers could get into 4 figures. February 1916: The French Tenth Army was relieved by the XVII Corps of the British Third Army commanded by Lieut-General Sir Julian Byng. 21 May 1916: Operation “Schleswig Holstein” commenced – an attack on the British lines along a 200 yard front in an effort to eject them from positions along the ridge. After shelling both forward trenches and divisional artillery positions from no less than 80 batteries, located on the reverse side of the ridge and out of sight, the Germans captured several British controlled tunnels and mine craters. 22 May: counter attacks by units of the 140th and 141st Brigades failed to remove the Germans from these positions. October 1916: the Canadian Corps relieved the British IV Corps stationed along the western slopes of Vimy Ridge. 1916 was the most active year of the underground war – the British exploded a total of 750 mines along the BEF front line, the Germans 696. 1917 was relatively quiet. 117 British mines were detonated compared with 106 German. By the beginning of 1917 it can be argued that the BEF had won the war underground. The Battle of Messines, 7-14 June 1917 was notable for the success of mining operations but at the Battle of Vimy, earlier in the year, 9-14 April the Commanding Officers took a more cautious approach to the use of mine warfare. In analysing the 19 distinctive crater groups fired by French, British, Canadian and Germans in the 4 miles of No-Man’s Land in the Vimy Sector it was decided that 4 should be avoided due to the presence of clay on account that they would be always full of water. Initially, a plan was devised for 26 large mines to be worked to support the assault – 4 were abandoned due to technical difficulties, 2 were detonated before 9 April for defensive purposes, 5 were fired as planned, 8 were prepared but not used and 7 others appear not to have been undertaken. The preparation for the assault on Vimy Ridge was planned months in advance and the TCs created extensive underground networks and fortifications involving 12 subways up to 1,300 yards long excavated to a depth of 33 ft. and used to connect reserve lines to front lines permitting soldiers to advance unseen. This work needed concealed narrow gauge railways, hospitals, command posts, water reservoirs, ammunition stores, mortar and machine gun posts, communication centres etc. The German tunnellers were also at work and every effort was made to destroy each others creations. I am very sorry to have to return you your letter addressed to your late husband together with the book by Ruskin on Political Economy. It may be some small consolation to you to know that your husband did not suffer, he was struck by an aerial torpedo and killed instantly one other man being slightly wounded. Your husband was a general favourite with his brother soldiers and appreciated by his officers. Wishing that the knowledge that he died whilst serving his country, bravely doing his duty in the gigantic struggle against an unscrupulous enemy, may help to assuage the poignancy of your grief. Sapper G.H. Waters was awarded the British War and Victory medals. The Canadians captured Vimy Ridge in April 1917, the Allies did not secure a break through, the Germans did not attempt to recapture the ridge even during the Spring Offensive and it remained under British control until the end of the war. The loss of Vimy Ridge forced the German High Command to review their defensive strategy and they retreated to the Oppy-Mericourt line. As part of this retreat, they operated a scorched earth policy. With the failure of the French Nivelle Offensive, the British had to keep the up pressure in the Arras sector in order to minimize French losses. The article confirmed that George Henry Waters killed by aerial torpedo. In a letter to his wife, officers gave great praise. He was well known in the district and his parents had the post office in Copley. The cemetery contains 563 Commonwealth burials including 25 officers and men of tunnelling companies of the Royal Engineers. “The Underground War: Military Mining Operations in Support of the Attack on Vimy Ridge 9 April 1917” Michael Boire 1992 p.4 Note: this source states that there were TCs numbered 33. “The Corps Expeditionary Canadien 1914-1919” Col. G.W.L. Nicholson 1963 p.502 quoted in Boire’s article. En.wikipedia.org/wiki/Battle_of_Vimy_Ridge Note: this source states that:”Of the explosive charges laid by the British, 3 mines were fired before the assault; another 3 mines and 2 specialized charges were fired at the start of the attack.” i.e. a total of 8 compared to Boise (Robinson) quotes 7.